REDSTONE ARSENAL, Alabama, September 24, 2018 — One soldier is proving childhood dreams can come true as she prepares to launch into space for her first time. Army Astronaut Lt. Col. Anne C. McClain, and her crewmates, David Saint-Jacques of the Canadian Space Agency and Oleg Kononenko of the Russian Space Agency Roscosmos, are scheduled to launch December 20 aboard the Soyuz MS-11 spacecraft from the Baikonur Cosmodrome in Kazakhstan for a six-month rotation on the International Space Station. 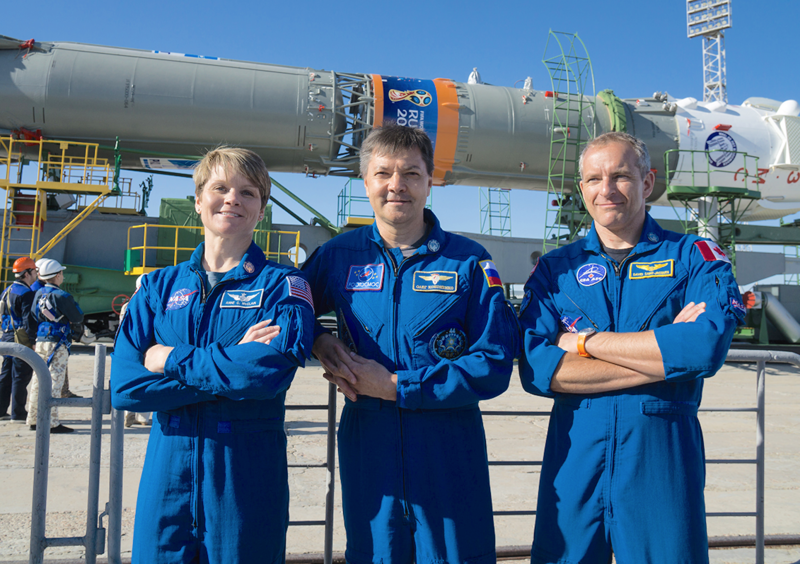 From left, future International Space Station crew members Army Astronaut Lt. Col. Anne McClain, with U.S. Army Space and Missile Defense Command/Army Forces Strategic Command; Oleg Kononenko, with the Russian space agency Roscosmos; and David Saint-Jacques, with the Canadian Space Agency, pose for a picture as a Soyuz rocket arrives at the launch pad June 4, 2018, at the Baikonur Cosmodrome in Kazakhstan.